"Ivan and his son Ivan"
Lesson Plan for a Middle school. This lesson is designed as an interactive lesson centered around famous painting by I.Repin. Table of content provides short description of all activities during this lesson. Students are invited to look on the painting for the short period of time and then answer questions. Looking again on painting, students discuss their answers. Then students discuss possible interpretations of this art work. Repin's painting as a criminal story. In groups, students discuss their criminal stories and each group choose the best story to share with class. Students read biography of Ivan IV. Questions-guide for the Ivan IV biography. Discussion about Ivan IV and his life. Comparison of monarchy and democracy. Who was I.Repin, the painter who painted "Ivan the Terrible and his son Ivan"? Is this picture out of time? Are tyrants still dangerous? Educational Goals covered. Suggested activities for further lesson development. Monday. "Ivan and his son Ivan"
Activity 1. To examine your attention prepare to look on a painting carefully during 20 seconds. If you ready, click READY! You had 20 seconds to look on a painting, now, please, answer the questions. What are the main colors on this picture? Is it day or night? Why you think so? How many people have you seen on this picture? Are these people rich or poor? Why do you think so? Have you seen some furniture? What was it? Have you seen anything except people and furniture? What was it? Have you seen any geometric figures? What was it? Have you seen any patterns which has symmetry? Activity 2. Look on this painting check your answers. How many of your answers were correct? If you number is What your results demonstrate. 0 or 1 Low attention. You have to work on similar exercises yourself. You may use pictures from magazines. 2 or 3 Average level of attention. 4 or 5 You have well developed attention to details. 6, 7, or 8 You are genius! You have an extraordinary developed attention. How does look a guy in a light cloth? How does look a guy in a dark cloth? What was used as a weapon? Was it fight here? Why do you think so? Imagine that you are a detective. You came and see this silent picture. Give you interpretation. Answer these question. What happened? Why do you think so? What would you do to solve this homicide? Tuesday. "Ivan and his son Ivan"
Activity 1. Students discuss their stories and assign to each other points. Each group choose the best story to share with class. Activity 2. Students read biography of Ivan IV. IVAN THE TERRIBLE is one of the most ruthless tyrants in history. He was Duke of Russia, tzar Ivan IV. He was known as Ivan the Terrible and earned his title. The name 'Ivan the Terrible' conjures up images of senseless cruelty and paranoia. Ivan appears to have been a man of huge contradictions - a man of God, who personally tortured his victims and beat his own son to death. Born in 1530, Ivan was only three when he inherited the Russian throne following his father's death. At the age of seven, he lost his mother who was poisoned by nobles at court. Ivan was crowned Russia's Tsar at the age of 17. Three weeks later he married, having chosen his bride in a national virgin contest. Virgins over the age of twelve were brought to the Kremlin to be paraded before him. He chose Anastasia Romanov, the daughter of a minor noble. His wife Anastasia helped to hold his cruelty in check, but in 1560 she died. He accused his nobles of poisoning her, and became even more mentally unstable. Until recently, most scholars have dismissed Ivan's accusation of murder as evidence of his paranoia. But recent forensic tests on Anastasia's remains have revealed more than ten times the normal levels of mercury in her hair. It is likely, that Anastasia was indeed murdered, sending Ivan into a downward spiral of murder and cruelty. Ivan had huge ambitions and launched a holy war against Russia's traditional enemy, the Tartars, showing no mercy to them. Ivan's conquest of Kazan, Astrakhan, and Siberia in the name of the church gave birth to a sixteenth century personality cult glorifying him as the Orthodox crusader. The years 1547 through 1560 are usually considered the constructive period of Ivan's reign. He appointed an advisory council, founded a national assembly, enacted reforms in local governments and drew up a new law code that standardized the responsibilities and duties of the aristocracy. He was noted for his highly progressive administrative policies. At the same time, he set up a secret police that has been described as the precursor to the KGB, the Oprichniki. They were ready to commit any crime in the Tsar's name. Ivan sentenced thousands to life–long exile in far-flung parts of the empire. Others were condemned to death; their families and servants often killed as well. Ivan would give detailed orders about the executions, using biblically inspired tortures to reconstruct the sufferings of hell. Several thousands people lost their lives from the hands of Ivan’s secret police. He was a quick-tempered, irascible person, very hard to deal with. His elder son Ivan Ivanovich (1554-1581), the heir, a strong person and supporter of his father, did not always agree with him. During one of their hot disputes King Ivan struck his son with his heavy staff. The blow was into temple and prince died. 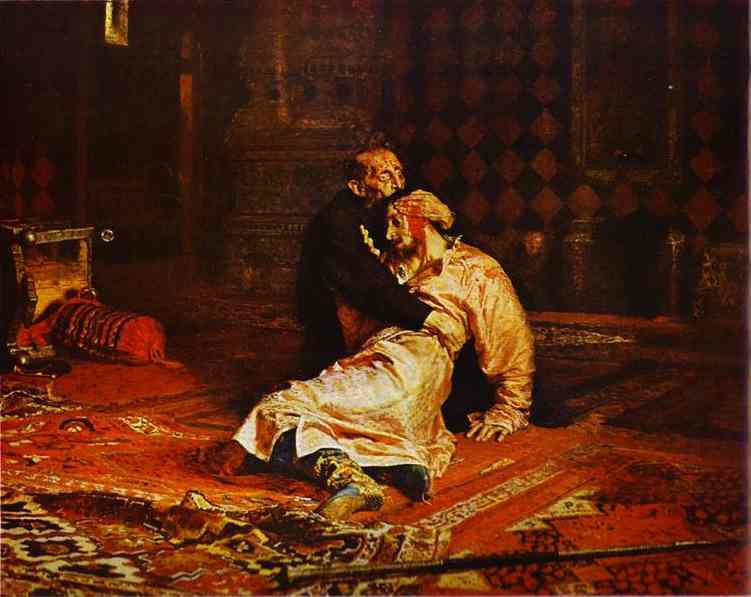 A painter, Ilia Repin, managed to show the tragedy of a father in his painting "Ivan and his son". Mad with sorrow and guilt, Ivan the Terrible had a dramatic round–about, posthumously forgiving all those he'd executed and paying for prayers to be said for their souls. Before his death, Ivan was re-christened as the monk Jonah and buried as a monk in the hope of finding ultimate forgiveness. Activity 3. Questions-guide for the Ivan IV biography..
Why Ivan IV has the name Ivan the Terrible? Why Ivan IV became orphan? What happened with his parents? What was a contest mentioned in this biography? What happened with oldest son of Ivan? What was the weapon of a murder? When Ivan the Terrible was a tzar? Which century? What is the country Ivan was Duke of? What did forensic scientists discovered about Ivan IV wife? Read again the biography of Ivan IV. Answer these question. How many killings were mentioned within Ivan IV family in this short biography? Why do you think there were so many killings? Wednesday. "Ivan and his son Ivan"
Activity 1. Discussion about Ivan IV and his life. Do you know now what is happening on this picture? Was murderer punished? Why not? Who was able to kill without punishment? Why? What is the meaning of the word justice? Activity 2. Comparison of monarchy and democracy. Finish the Table. Power concentrated in one person's hands. Police should not obey law. Police obeys only orders of tzar. Everybody has right of free speech. Assassinations are frequent since only tzar has power and there is no way to get power except assassination. Read how Ivan IV became a king. Recall how the president of U.S. was elected. Answer these question. What is the difference in the ways of getting power for monarchy and democracy? What do you prefer? Why? Thuesday. "Ivan and his son Ivan"
Activity 1. Who was I.Repin, the artist who painted "Ivan the Terrible and his son Ivan"? Ilya Efimovich Repin was born in a small Ukrainian town in the family of a professional soldier. As a boy, he was trained as an icon painter. Then he studied in the St. Petersburg Academy of Arts where his diploma completion project was awarded The Major Gold Medal. Barge Haulers on the Volga (1873) was the first considerable work painted by Repin after graduation. In 1873, Repin went abroad and settled in Paris where he witnessed the first exhibition of the Impressionists but didn't become their follower. After returning to Russia, Repin created the majority of his famous paintings such as Krestny Khod (Religious Procession) in Kursk Gubernia (1883), Unexpected Return (1884) and Refusal from the Confession (1885). This time Repin became closely connected with artists who called themselves Peredvizniki. Repin rarely painted historical paintings. The most famous of those are Ivan the Terrible and his son Ivan (1895) and The Reply of the Zaporozhian Cossacks to Sultan Mahmoud IV (1891). The expressiveness, intense composition and psychological insight in rendering the characters produce an unforgettable impression on the spectators. Repin’s artistic legacy includes portraits as well. His portraits are distinguished by the power of the visual characteristic and the economy and sharpness of execution. After the bolsheviks’ revolution, Ilia Repin lived and worked in his estate Penates in Finland where he died in 1930. In Penates, there is now a Repin museum, and visitors have the opportunity of gaining a detailed knowledge of the artist's life and work. Activity 2. Who were peredvizniki? The Peredvizhniki is a group of artists who broke with Russian Art Academy and initiated a school of art liberated from Academic restrictions. Their paintings often had deep social and political motives of the nineteen-century Russia. This group of artist has also been referred to as the Wanderers, the Circle of the Itinerants, and the Association of traveling art exhibitors. Despite the rapid changes in Western art in the nineteenth century, the Russian Academy of Arts was far behind and still taught and promoted the neo-classical technique and subjects of painting. In Russia, painters survived by getting commissions from the royal family or from others of the nobility. The Royal family, nobility, and Professors from the Russian academy of Arts tended to dictate the content of the paintings, preferring art dealing with religious issues. Starting in 1863 about a dozen of artists, most of them sons of peasants, merchants, and the petty bourgeoisie broke away from the Academy since they felt alienated from their patrons. Opposing the interests of the Academy, they wanted to paint contemporary Russian life choosing topics according to their own priorities. This group called themselves Peredvizniki (moving artists). They started the Society of Traveling Art Exhibitors as society of mutual support and had their first exhibition in 1871. The idea of traveling exhibits was to get art out of the capital, encourage art education in the provinces, and foster creation of a national school of art. While they shared these goals, they also had a lot of diversity in their styles, political outlook and philosophy, although they tended to work in a realistic, representational manner. They abandoned formal portraiture and mythological subjects and focused attention on genre painting, landscape, and historical compositions based on historical events expanding dramatically the boundaries of painting. Activity 3. Are tyrants still dangerous? Why people accept tyrants? Is democracy better? Is republic better? Why? Recall all discussions about tyranny. Create your own quote on issue of tyranny. Hint. Why tyranny? Monarchy or democracy? Friday. "Ivan and his son Ivan"
Activity 1. Create diamante looking on the painting "Ivan the Terrible and his son Ivan." Diamante is a poem that has a shape of diamond. The simplest version of this poem has four lines. One Word That comes to mind when looking at the work of art; this word will also be the name of the poem. An Action Phrase based upon something you see or sense in the work of art. (A color, a mood, etc.) and something else in the world. Another word that comes to mind when looking at the work of art. Part 1. Choose TRUE or FALSE options. Diamante is a poem that has four lines. First wife of Ivan the Terrible died from poisoning when she was 17 years old. Peredvizniki were Russian artists who travel with their exhibits. The idea of traveling exhibits was to get art out of the capital and encourage art education in the provinces. The secret police of Ivan the Terrible obeyed law even if it contradicted with tzar's will. Ivan IV have poisoned his son because son did not respect his opinion. Ivan IV had highly progressive administrative policies. Ivan IV parent have chosen wife for him. Ivan the Terrible was chosen by Russians to be their tzar. 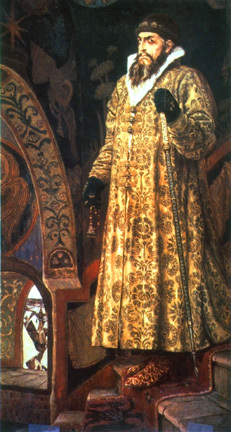 Ivan IV was glorifying by church as the Orthodox crusader. "Ivan the Terrible and his son Ivan" is a picture of well known German artist. Repin poisoned Ivan's wife because she looked terrible. Oprichniki and KGB are alike because these both types of police support tyranny. Monarchy and democracy are different mostly because tzar has a crown and president does not. If President of U.S. would kill someone, than he would not be punished. If tyrant would kill someone, than he would not be punished. Part II. Write one page story about the painting "Ivan the Terrible and his son Ivan". Recall what we learned during last week. Bring you own picture. It could be your own art or copy from a magazine. The most interesting picture from your group will be presented to all class. Prepare story to share with your classmates. Educational goals. "Ivan and his son Ivan"
Students learn about the meaning of historical paintings. Students get familiar with Russian artist, I.Repin. Students learn about group of Russian artists called "peredvizniki". Students learn to pay attention to the details on painting. Students learn to discuss their point. Students learn about detective work. Students learn to derive conclusions from details. Students learn to read using reading guide. Students get familiar with power of forensic science. Students learn to judge behaviors of other people. Students learn to write their quotes. Students learn how to write diamante. Students learn about main differences between tyranny and democracy. Students learn about danger of tyranny and importance of participation in political life. Suggested Extra Activities. "Ivan and his son Ivan"
Not looking on the picture, students discuss math patterns. Watching movie "Ivan the Terrible" by famous film-maker Eizenshtein. Talk more about tyrants of middle ages and of modern days. Go to Art museum to look on historical paintings. Find more articles about forensic science. From several music peaces, choose the one which fits to the mood of the painting. Using available data, calculate how old was Ivan's the terrible wife when she died.